I have a simple topology set up exactly like the image above. 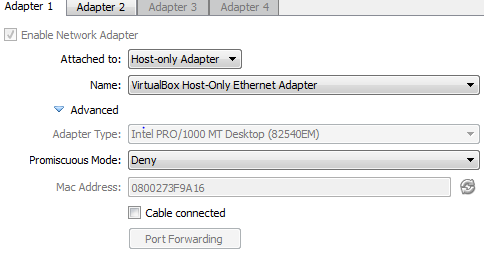 The actual VM configurations does not have adapter 2 set. 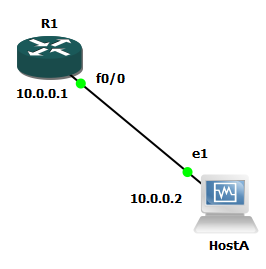 Adapter 2 is generated when I add a link in GNS3 from HostA to R1. I'm having an issue where neither HostA nor R1 can ping each other. Am I missing something here? I've made sure that "test settings" worked correctly in GNS3 virtualbox settings. I've also searched numerous thread, and tried several solutions but none seem to work for me. Am I missing a configuration within GNS3? Doesn't the router need to be aware of the UDP ports to listen on, and send back to? Just my guess. I've had the worst time getting Virtual guests to talk to anything other than another guest. I wish I knew how to make them talk to my routers via switches (swouter or not). Hey Dirkgently - thanks for the reply. Maybe I don't fully understand your suggestion here, but the host is directly connected to the router, why does the router need to listen to a particular port? Isn't this setup essentially the same as 2 connected routers? They should be able to ping each other given that they are on the same subnet since they are directly connected. Effectively, this is like connecting them with a crossover cable. Fine for talking to each other, but not the rest of the network. Looking at a router in my topology, it's set to 127.0.0.1:7200 console 2108 aux 2508. Personally, I've never gotten a VM guest to talk to a router or switch. I need help with this too, since I need for a server to see the whole network. Networking between the routers and switches themselves is perfectly fine. I just can't get a client to talk. 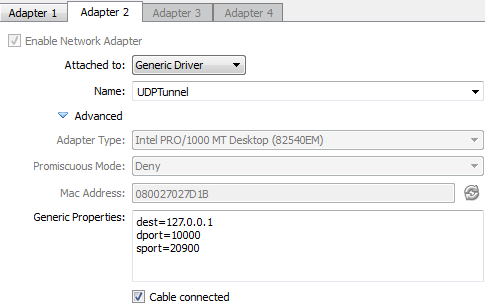 The UDP part your're seeing is seperate from the router. So as you say the UDP Tunnel is simply to create a network cable. The router doesn't know anything about this, it just has it's interfaces. In the example posted, have you tried using a basic Ethernet Switch in GNS3 in the middle? I have used this method before with great success... even configuring VLANs. It's a 2008R2 serving running PRTG for SYSLOG, SNMP, and Netflow stats/graphing. That directly connected to a plain switch, along with C1 (with multiple connections to simulate many hosts), 2 2610XM routers (for HSRP/VRRP/GLBP, OSPF, and EIGRP practice), a 36XX router to pretend to be two internet connections, and a host on the other end of R3 to test end-to-end connectivity. I've tried this with every netowrking option I can think of, and I *still* can't get it to work. I need that 2008R2 server to be able to see and gather info from all the nodes in the topology. What am I doing wrong? I've asked several times here already, but never got any response. What I would do start with is to break your topology down eg: a router, a switch and a VBox. As a test I've just set up this very topology in GNS3. On R1 I configured an IP on FastEthernet0/0 and brought the interface up. Then configured a DHCP pool. eth1 was assigned an IP address from the router pool and pings work in both directions. Were you using UDP Tunneling, Host-only, Bridged, Internal Network, or NAT network when you set yours up? Well, connecting R1 -> switch -> VM didn't work. Vboxwrapper set E1 on the PC to UDP Tunnel, no DHCP address was assigned, and even assigning a static IP, I couldn't ping the router. I changed it to host-only adapter, and assigned it 10.10.10.2 in Vbox manager, assigned the VM a static of 10.10.10.15 (R1 is 10.10.10.1). From the VM, I could ping 10.10.10.2, and itself, but not R1. I took the switch out of the loop, and directly connected R1 to the VM. Now they can see and ping each other, using 10.10.10.1 and 10.10.10.15 respectively. I'm glad that part works, but how am I to get the PRTG VM attached to a switch, so it can monitor all the routers, switches, and VMs? I can now ping from VM to fa0/0 on R2. That's a marked improvement. Now the issue is getting a switch in the mix, and trying to get C1 to work, so I can simulate traffic from a bunch of hosts to a 3rd router that has a "server" behind it, as well as trying to implement HSRP/VRRP/GLBP, and getting tracking and weighting working. I then added a switch between them, and theoretically, no config is needed for the vms to ping each other. Indeed, they were able to ping each other. Please try to ping VM to VM with a switch in between and let me know if it works first. We'll go from there.